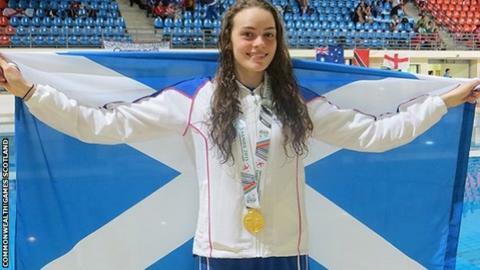 Swimmer Erin Robertson has won Scotland's first gold medal at the Commonwealth Youth Games in Samoa. The Ayrshire athlete, 16, who was first in the 50m breaststroke, said: "When I saw that I'd won it felt like I was dreaming, like none of it was real. "I saw the scoreboard and realised it was the first gold medal for Scotland and I just couldn't believe it." Kieran Preston in the men's 50m breaststroke and Tain Bruce in the 100m butterfly each won bronze medals. "It was amazing to stand on the podium and see the Scottish flag up the top and hearing the Scottish national anthem being played for the first time, it was everything I dreamed it would be," said Robertson of South Ayrshire Swim Team. She added: "I've won golds before but I've never had the anthem played for me, it's definitely an experience I'll never forget. It's really not sunk in yet." Preston, from Stonehaven, said watching his team-mate pick up a gold helped inspire his own performance. He touched just ahead of another Scottish youth swimmer, Benedict Tortolano, in what he says is not his strongest event. "After watching Erin get the gold it really boosted me," he said. "With Craig (McLean) getting the silver and the other medals yesterday, the swimming team just has a real buzz at the moment, it's a great feeling. "It's great preparation for my main event tomorrow. This was my weakest event and I'm just so surprised to get a bronze." McLean won silver in the men's 100m freestyle and will challenge for another medal across the same distance in breaststroke. And Meg Finnon, who picked up a silver in the 200m butterfly, will go in the 800m event on Thursday, when the swimming concludes with all six squad members in action. The haul in the pool takes Youth Team Scotland's medal total to 14 with two days of the Games left. The tally will increase because several other athletes are through to finals. The competition is a step on the way to the Commonwealth Games in Gold Coast in 2018. To date 66 Scottish athletes have progressed from youth to senior Commonwealth Games, many of whom have won medals.